The first step is usually a way to introduce SoaVis to the organisation. Some have already seen SoaVis at work on this site (did you see the Demo page?) but want to be convinced it will work in their situation as well. This step could take a week of preparation followed by an introduction on site. The basis of the SoaVis approach is the visualisation of services and their relations. In order to keep the information up to date, a process must be in place to make this as easy as possible, preferably automated. In this step the current development process is analysed to determine the next steps. The information that is visualised is only one way to represent that information. In order to prevent information conflicts, it is strongly advised to have a single source for that information. 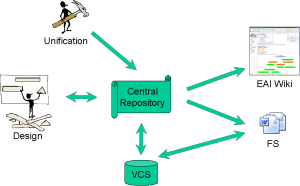 A Central Repository is the term used within SoaVis to indicate this single source. Usually it is already implemented and known with a different name, e.g. as a Git repository or other version control system. The automated process described above is supported by a number of tools. In some situations, it may prove necessary to implement some new tools or to adjust some other tools. For instance when Archi is used for designing services, there is an extension which can automatically generate export files that can be imported by WP SoaVis. With the implementation of the tools, the process is not automated yet. These tools need to be used as well. So in this step, the process is completed with the instructions on how to use the tools in the development process. Adjustments to the existing process may comprise the addition of extra status information to a design to indicate whether the service is in production or an additional approvement milestone is necessary to indicate which services may be public and which need to be private. The implementation of a new process will only be successful when it is supported by all staff. This is the main purpose of the training. Usually, the formal training will only be a final milestone as main support is already taken care for during the design and implementation of the new process. The final, but often most valuable, step is the migration of existing services. This migration seems more complex than it is. With this migration, there will be a firm base of information which will prove the application of the SoaVis apprach. New functionality can be implemented easily as low hanging fruit by exploiting interesting but until today ‘forgotten’ services. Depending on the organisation and the current way of working, some steps may prove to be very easy. In most professional companies there is already some sort of Central Repository storing the current code base. The steps are also explicitly not numbered because there may be an overlap. E.g. tool development will often occur together with the implementation of the process.